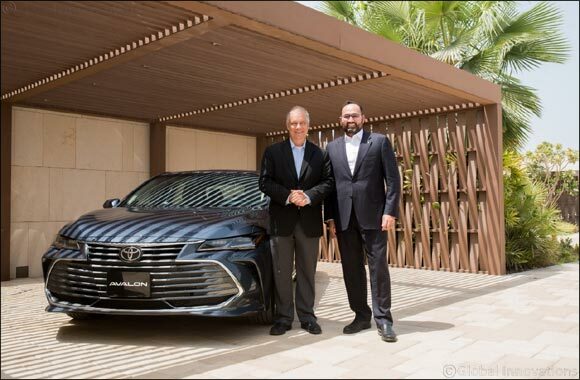 Dubai, United Arab Emirates, September 05, 2018: Combining a new level of authenticity and exhilaration, the all-new 5th generation Toyota Avalon has been launched in the UAE by Al-Futtaim Toyota, leader in sustainable mobility since 2008, heralding a new, refined driving experience that inspires confidence and luxury. For its fifth generation, Avalon received an all-encompassing makeover spearheaded by Chief Engineer, Randy Stephens, who was present in the UAE for the press launch. With a development goal to be a “Daring Sedan,” his team focused on two keywords throughout their development paradigm: Authenticity and Exhilaration. Authenticity refers to a design that is purposeful with the use of premium material, while Exhilaration is expressed through a thrilling performance that inspires confidence. Reinforced by a Toyota New Global Architecture (TNGA) platform - which represents an entirely new strategy to the way the company designs, engineers, and packages its vehicles, providing a comfortable and stable ride with superior handling characteristics- and enhanced by a new fuel-efficient 3.5-liter V6 engine and a host of comfort and safety features that are complemented by Toyota Safety Sense, the 2019 Toyota Avalon embodies an overarching desire for high-caliber, design-centric, and technologically-savvy modes of premium yet attainable transportation. Since its UAE debut in 1995, one year after its global launch, the Avalon has come to be embraced by customers who appreciate ride quality, comfort and roomy interior space, especially when commuting for long distances between the Emirates. Thanks to the new TNGA platform, the new Avalon's exterior is now longer, lower, and wider than before. Avalon’s new expressive look diligently reflects the mixture of performance-focused personality, invigorating driver experience, and a premium, spacious image. A design philosophy of ‘Technical Beauty’ permeates through the Avalon’s body lines and cabin landscapes. The low and sleek silhouette is created by low overall height and rearward position of the roof end. The distinctive front grille and the slim all LED headlamps speak to the new Avalon’s sportiness and elegance. Side air intakes in the front bumper realize both enhanced aerodynamic performance and excellent design, while the rear combination lamps with a distinctive 3-dimensional slim aero fin shape integrate backup, stop, and turn lights into a single harmonious, fluid form. Striking a smooth connection between a stylish design, exquisite luxury, and greater convenience and comfort, the Avalon’s cabin is accentuated with a range of advanced features, including an enhanced 9-inch multimedia display, a 10-inch colored and adjustable head-up display (HUD), wireless charging system for smartphones, ambient illumination, dual-zone automatic air conditioning system, 14-speaker JBL surround sound system, multi-adjustable power and ventilated front seats, as well as 60:40 split folding rear seats. While retaining Toyota’s traditional values of superlative build quality and safety, the unique TNGA platform injects a fun driving experience that plays on all the senses. The new multi-link rear suspension allows for the enhancement of many performance attributes, such as a wider rear track, lower centre of gravity, and an aggressive stance. Drivers can also adjust Avalon’s ride feel with the simple press of a button – Normal mode prioritizes comfort, while Sport emphasizes handling with tighter, highly responsive footing without diminishing Avalon’s celebrated ride suppleness. Complementing the all-new Avalon’s daring looks is a thrilling drive personality imbued by a new 3.5-liter V6 engine, which produces a maximum output of 298 hp and 356 N‎m of torque and is equipped with the latest Direct Injection 4-Stroke Gasoline Engine Superior Version (D-4S) and Variable Valve Timing-intelligent Wide (VVT-iW) systems to achieve top-notch power performance, environmental performance, and fuel efficiency. The engine is also mated to an all-new eight-speed automatic transmission that merges smooth, precise gear selection throughout the RPM range allowing better fuel efficiency and on-demand power. As with any other Toyota model, safety remains a top priority for the 2019 Avalon. The all-new vehicle’s foolproof safety system is complemented with Toyota Safety Sense, an advanced safety technology package that includes Pre-Collision System (PCS), Dynamic Radar Cruise Control (DRCC), Lane Departure Alert (LDA), and Automatic High Beam (AHB). In addition, the car features a comprehensive array of safety features to protect its occupants, such as 10 SRS airbags, Vehicle Stability Control (VSC), Traction Control (TRC), Anti-lock Braking System (ABS), Electronic Brakeforce Distribution (EBD), Brake Assist (BA), Electric Parking Brake (EPB) with Brake Hold function, Blind Spot Monitor (BSM), Rear Cross-Traffic Alert (RCTA), and Hill-start Assist Control (HAC), among many others. The 2019 Avalon is available across all Al-Futtaim Toyota showrooms for AED 144,900 including VAT for the SE+ model and AED 164,900 for the Limited grade.